Areldur is an Altmer crusader added by the Knights of the Nine official plug-in. 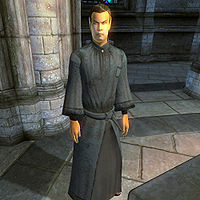 He is a priest found in the Chapel of Stendarr in Chorrol, where he plays a major part in the quest Stendarr's Mercy. After the quest is completed, the disillusioned priest travels to the Priory of the Nine and requests to become a member of the Knights of the Nine. Once he is a knight, his name becomes Sir Areldur. After you have spoken with the ghostly reincarnation of Sir Casimir in the undercroft under the Priory, Areldur will appear in the Chapel and wander around all day long, without ever eating nor sleeping, eagerly awaiting your arrival so he can pass on important information about the Gauntlets of the Crusader, Sir Casimir's unspeakable deed and what consequences Kellen must suffer as a result. When asked about the Gauntlets he will say: "Ah yes. The Gauntlets have been here for ages. I know only the basic story behind them; they're more of a novelty these days. My only real involvement with them these days is keeping the youngsters from hurting themselves trying to pick the gauntlets up. What is your interest in them, if I may ask?" If you ask him about the background story he will tell the tale: "Yes, well, I don't know the whole thing. A great many years ago, a knight of the old Order did something terrible, and the gauntlets just fell off. They dropped to the floor right where he stood, and no one could lift them. It was a sign of the curse placed upon this knight by Stendarr, I think. That curse still lingers on today, in fact. Poor Kellen." When you ask about Kellen, Areldur will say: "Oh, why he's a descendant of that very knight from so long ago. The curse has affected his family all these years. He suffers from it now. He came here from Hammerfell seeking a cure, but, ahh... well, there's really nothing that can be done for him, I think. He may know more of the story than I. Perhaps you should speak with him, if he's feeling well enough." If you choose to ignore his story and instead insist on retrieving the Gauntlets right away, Areldur will get upset and say: "Oh, I'm afraid that's quite impossible. They don't move. Not even a bit. As if they're the heaviest things in the world. Don't you know the story behind them? I'm not, ahh, familiar with all the details, but I know roughly what happened." If you insist, he will get angry but will still point you towards Kellen: "I'm telling you, you can't pick them up. Try it yourself if you won't believe me. If you won't listen to me, then go ask Kellen. He's descended from the very knight who was cursed. He'll tell you the same thing." Finally, he will elaborate on the Curse, although he suspiciously hesitating: "It's a horrible thing, truly. One cannot help but pity those such as Kellen, who have such a burden placed on them through no fault of their own. But... But if it is the will of the Nine, then there is little that can be done." Talking to the cursed and deadly sick Kellen in the Chapel Hall will reveal that Areldur is holding back information: "What is it? Is there a cure? Has Areldur found a cure? I know there's something he's not telling me!" After describing his condition, Kellen will once again mention Areldur's suspicious behavior: "Areldur has let me stay, mostly out of pity I think, but there's something else. I swear he knows more than he tells. I've seen plenty of pity in peoples' eyes over the years. I grew up recognizing it. But with Areldur... There's something else there. And when he speaks to me, there are times I'd swear he sounds... Apologetic. Guilty, even. Why would that be? What reason does he have to hold back information? I know I'm a doomed man, one way or the other." Confronting Areldur with Kellen's statements will reveal his lack of faith: "I... I cannot face him. I know what might be done for him, but I haven't the will to do it. I wish I could help him, truly I do, but I cannot muster the strength to damn myself on his behalf! The curse... I know what would lift it. But I cannot do it. The only way to free Kellen of his curse is to take it on myself. I am not strong enough to do this, and so I am a failure. I fail Kellen every time I speak to him, and I fail Stendarr every time I pray to him and do not ask for the power to lift the curse. Do you know one who would do such a thing? One who would pray at this Chapel's altar, pray to Stendarr for the power to lift this curse?" He will then give you one final warning: "I've told you. The only way to lift the curse from Kellen is to pray to Stendarr for the power to free him. But that means taking the curse on yourself. You'll be marked for life, as will all your children and your children's children." After you have prayed at the altar and lifted the curse from Kellen, a surprised Areldur will say: "You... You lifted the curse? But... That means that now you've cursed yourself! Why would you do such a thing?" 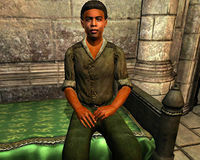 After you have picked up the Gauntlets of the Crusader with ease, Areldur will give you one final speech and admit his failure as a priest: "I can't believe you were willing to do that for Kellen. To sacrifice your own well-being without hesitation... What business do I have acting as a priest if I'm not willing to do all I can in helping those who need it? Perhaps I need to re-think my calling." This moment of clarity will cause him to leave the Chapel immediately and travel all the way to the Priory of the Nine in the West Weald. Armed only with a torch, he heads in a southeastern direction using the Black Road, then heads south on the Red Ring Road until he heads west towards Skingrad on the Gold Road. He finally ventures south on the unmarked road west of Bloodcrust Cavern, passes the Ayleid ruin of Silorn and then fights his way through the wilderness until he arrives at the Priory after 18 hours of traveling. Once there, he will wander around the ground floor and only sleep between midnight and 6am, anxiously awaiting your arrival. When you approach him, he will ask you to redeem him by making him a member of the Knights of the Nine; "I find myself here, at your disposal. I want to make up for the mistakes I've made, and devote myself fully to the faith. If it pleases you, I would join your Order and serve the Nine at your side. What say you?" If you accept he will happily say: "Thank you. It means a great deal to me. Excuse me while I gather the equipment I need." He will then head down into the basement and take off his grey robe and stitched leather shoes and instead slip into a set of appropriate light armor, including the Knights of the Nine Cuirass paired with a set of regular Chainmail armor, including a pair of gauntlets, greaves, a helmet and boots. He will wield a leveled but unenchanted bow with 5 leveled arrows and a longsword of the best possible quality. When attacked, he will block with a Knights of the Nine Shield. He will also carry a random amount of Restore Health potions to aid him in combat. He will wear this new set of armor all day long, but will still slip into his old robe when he goes to bed. Areldur also knows a leveled set of crusader spells, as well as one extra minor restore health spell. The new life as a Knight obviously fits the former priest perfectly, and he will, along with the other residents, sleep in the bedroom area every night between 10pm and 6am. After waking up, he strolls around the house until midday when he gives in to old habits and spends three hours in the Chapel of the Nine across the courtyard. At 3pm he returns to the Priory for a three-hour meal. At 6pm he heads down into the basement, draws his sword and spends three hours hacking away on the training dummy in preparation for the final confrontation with Umaril the Unfeathered. At 9pm he heads upstairs and loiters around for an hour before his bedtime at 10pm. When you have collected all the relics and finished the Sword of the Crusader quest, Areldur will, along with all the other Knights, relocate to the Chapel of the Nine and listen to The Prophet's ramblings and will continue to do so until you interrupt the service. Once you initiate the final quest by receiving the Blessing of Talos, Areldur will run all the way to Garlas Malatar west of Anvil and await your signal to launch the attack. During the attack, he will run headfirst into the ruin and fight the many Aurorans in order to clear the path for you. Like the other Knights, he will disappear when you touch the Dark Orb in the second zone of the ruin. 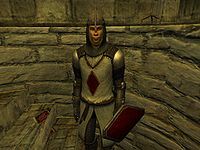 When you return to the Priory after the final battle against Umaril, you will find Areldur lined up with the other surviving Knights in the courtyard, listening to Sir Thedret's final speech. When all is said and done, he will return to his life and daily routines at the Priory and will offer to aid you in battle should you approach him. If Areldur dies during the battle, the surviving Knights can be heard discussing the heroic priest: "It's nothing really. I was just thinking about poor Sir Areldur. He was a fine knight." and "Well... it's Sir Areldur. I don't understand how he can be gone. He was the best of us..."
Areldur joins the Knights of the Nine faction after completing the quest Stendarr's Mercy. When choosing the 'Gauntlets of the Crusader' topic while talking to him, subtitles for what he's supposed to say will appear: "Of course you were the one to lift the gauntlets. You succeeded where so many others, including myself, have failed." However, he remains mute and the subtitles vanish after three seconds. This bug is fixed by version 9 of the Unofficial Oblivion DLC Patches.